Welcome. 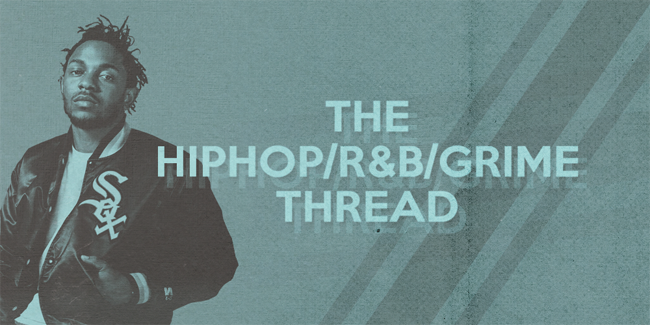 Here is the place to discuss anything Hip hop, R&B and Grime related topics. I was disappointed with Under Pressure. Can't say I have listened but I know about the hype. What's your favourite album of 2015 so far? Good album. His best project by far in my opinion. Thought RED was really good as well, sort of fell of with Jesus Piece though. Is RED the album that has the Kendrick and Tyler feats? They are decent but he hasn't really released anything of late for me to be excited for TD2. @Akinfenwa Here it is mate, enjoy! You can just post the link on this platform. No need to embed it. Lyrical Geniuses We got any old school 90's Hip-Hop lovers on the forums? Although this Straight Outta Compton movie looks meh, it instantly just makes me want to listen to music with meaning again, thank god it's creeped back into mainstream hip hop. There was on the last platform. I listen to mostly to the 'new school' artists but there are a few obvious artists I listen to that aren't.